How is spring steel so hard? The mechanical properties of a steel object are influenced by the metal composition, the manufacturing process, and the final heat treatment of the object. Spring steel is a steel that was heat treated in a way that makes it springy. But at the same process, it gets surprisingly hard. For example, my side-cutting pliers shows dents in the blade after cutting 1mm spring steel wire. Hardening the same steel would be done by a different, but similar heat treatment, that's not what my surprise is about. The steel properties "springy" and "hard" are clearly related. But my intuition keeps telling me that there is some kind of contradiction between the two properties. I see that the heat treatment causes different structures in the steel, and they may just be similar - but I feel like I'm missing something on a higher level, regarding the two properties. Are the material properties "springy" and "hard" related in general materials? If so, what is the relation in general, and in the steel structure? "Springyness" is called elasticity. This is described by a modulus of elasticity, also for elongation called Young's modulus $Y$. 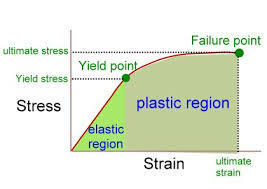 Looking at a stress-strain curve [source] as below, the elasticity is the slope of the straight line in the elastic region. "Hardness" is different and is not described by the modulus of elasticity or similar. The more pure and perfect your material microstructure is, if it for example is a crystal, the softer it is. If there on the other hand are errors in the crystal - errors like dislocations, impurities and other atomical defects as well as other imperfections as grain development - the material gets harder. Then rows of atoms in the lattice of the crystal have a much harder time "stretching" and "slipping" and "sliding" around. For lower grain sizes the hardness as a rule-of-thumb increases, called the Hall-Petch rule (though there is a limit). It is all about adding disturbances to bring tension inside the lattice, keeping the atomic positions fixed. What a heat treatment does, is in fact to trap impurity atoms inside the lattice. The old iron smiths from thousands of years back utilized this without knowing the cause. When they heated up steel, at a certain temperature it changed it's stable crystal type. Carbon atoms from the ashes in the open fires where mixed into tiny gabs and spaces in unit cells here and there on the atomical scale. Cooling it down fast (quenching in a bucket of water) closed the lattice and changed the unit cell structure rapidly, since the prefered crystal type is different for lower temperatures. Carbon atoms may be trapped, and impurities where hereby added. The steel was much, much harder. The Japanese Katana Samurai swords from ancient times are examples of mechanical hardening on top of the heating treatment. They hammered the metal flat, folded it, hammered it, foled it, and did this for many, many layers. The resulting microscale disturbances were violent and the crystal structure was full of imperfections and very much harder that typical heat treated hardened steel. 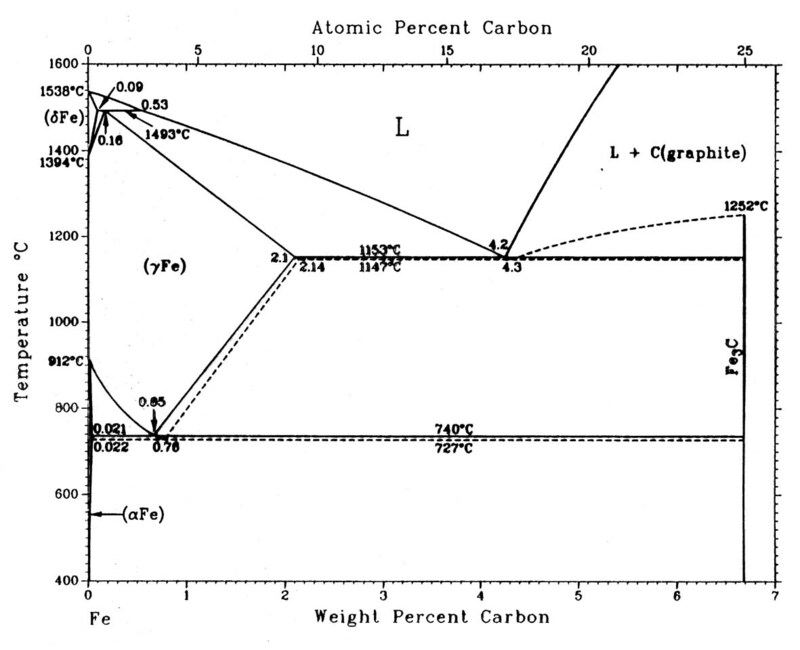 Pure iron is all the way to the left, and the more to the right you go along the axis, the more carbon is added. Each area is a specific phase, and phases have different crystal types (different atomic arrangements for each unit cell) for different temperatures (and composition). This does not tell how the microstructure looks, just what phases are prefered. Because even at a state of prefered phases in this diagram, you can violently mess the structure itself around mixing up all the grain orientations from the above described methods of heat treatment, mechanical treatment etc. Not the answer you're looking for? Browse other questions tagged condensed-matter material-science metals or ask your own question. How much does a steel spring wire bend due to it's own weight? Is this the strongest steel? How hard is a Prince Rupert's Drop? Will an extremely hard material wear away or fatigue if enough very-low energy contacts occur with a softer material? Why steel can be blunted by ice?